LAS VEGAS – Las Vegas will celebrate the 2016 Chinese New Year with a stunning collection of symbolic décor, traditional Chinese cuisine and experiences to commemorate the Year of the Monkey. According to the Chinese zodiac, the upcoming year will be full of optimism and is believed to be a year in which anything can happen; making Las Vegas the quintessential destination to celebrate. 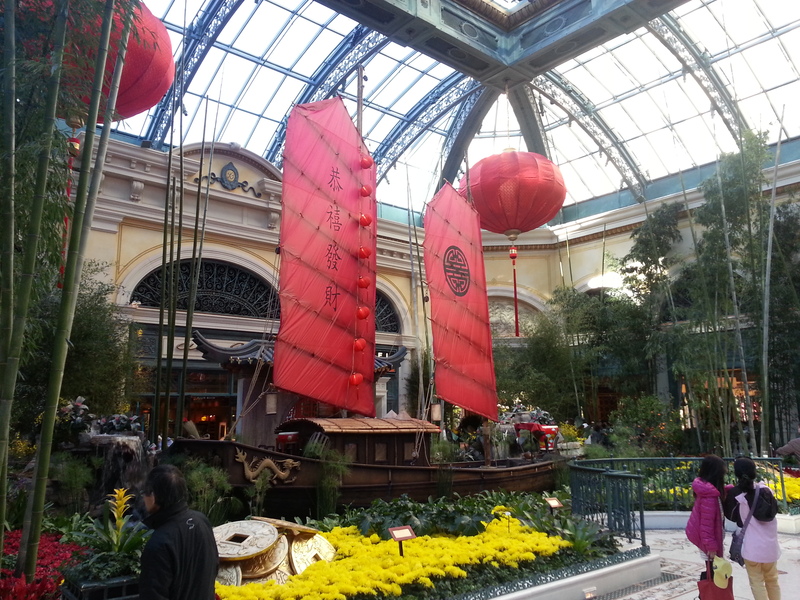 Bellagio’s Conservatory & Botanical Gardens celebrates the Year of the Monkey with a spirited display now through March 12. The display’s vibrant centerpiece features a garden representative of monkeys and their natural habitat. A family of 12 Macaque monkeys can be seen atop a 14-foot mountain working together and using their intelligence and creativity to reach the peaches descending from the sky. At the Conservatory’s entrance, six colorful Chinese children topiaries play on each side of the moon gate bridge above a tranquil pond filled with Koi fish. The children are each made up of 5,000 flower stems, including red, purple and yellow carnations and green and yellow spider mums. The North Garden features a stunning 18-foot tall Chinese money tree made of 384 sparkling gold coins, weighing a total of 3,000 pounds. The base of the tree is surrounded by four-foot tall Ingot fountains and I-Ching coins. Surging water from the fountains descends on the money tree to keep it strong and vibrant. The Conservatory is complimentary and open to the public 24 hours a day, seven days a week. Beginning, Feb. 4, ARIA Resort & Casino’s main lobby will delight visitors with celebratory décor in honor of the Year of the Monkey. Upon entrance to the lobby, guests will be greeted by a 229-foot dragon weaving its way through clusters of Chinese lanterns and around the money tree made up of 88 golden coins. This spectacle also will be seen during the dragon and lion dance Feb. 8. The Flower Carpet on the first floor of The Shops at Crystals features a 12-foot-tall, illuminated and golden-coated monkey situated atop a bed of gold coins while holding a peach. The West Carpet features a Buddha sculpture surrounded by 50 citrus trees and 500 orchids. A total of 1,000 bromeliads, red and yellow mums and birds nest ferns were used throughout the two gardens at The Shops at Crystals. Guests may kick-off the Chinese New Year with a ceremonial lion dance complete with firecrackers and eye painting ceremony at The Venetian. The high-energy and traditional parade of dancers and drummers, dressed in authentic clothing, will wind its way through the resort circling everyone to bring them good luck and prosperity for the New Year. The dance will begin at 3 p.m. on Feb. 8 in The Venetian porte cochere. 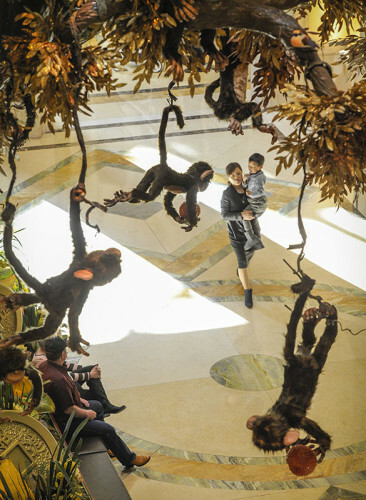 Also, The Palazzo’s Waterfall Atrium and Gardens boasts a display anchored by a five-foot, 300-pound Monkey King seated at the base of a 38-foot wishing tree and sporting a chest plate adorned with more than 8,000 hand-sewn gold coins. Playing among the wishing tree’s 8,000 branches of golden foliage: 28 mischievous monkeys, each with a hand-painted face. 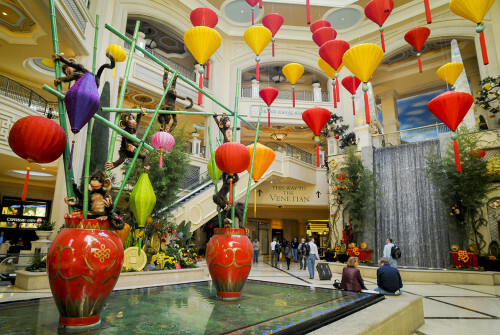 To add to the festivities, The Grand Canal Shoppes at The Venetian will be holding a traditional Chinese fan dance on Feb. 8, at 4 p.m. above the waterfall. During and after the fan dance, more than 500 red envelopes will be distributed to guests. The envelopes will be filled with a prize — anything from a gift card to a chocolate gold coin. Red envelopes are traditionally handed out during Chinese New Year and symbolize happiness and wealth. On Feb. 13 and 14, actor and TV personality Hacken Lee will reunite with singer and actress Joey Yung after an 11-year hiatus. These wildly popular entertainers from Hong Kong have won multiple awards and will grace the stage for a special concert series in The Palazzo Ballroom at The Venetian. As a legendary creature and good luck symbol, the illuminated dragon display once again shines at The Forum Shops at Caesars Palace. Standing at one foot high and 22 feet wide, the dragon is covered in 30,000 red and amber LED lights, flickering vibrantly on its perch behind gold and velvet fencing. Students from The Meadows School will perform a traditional dragon parade around The Forum Shops on Feb. 8 with special guest, Las Vegas Mayor Carolyn Goodman. Legendary pop and folk singer Tasi Chin graces the stage at The Colosseum at Caesars Palace for one night only, Feb. 12 at 10 p.m. “Tsai Chin: Chinese New Year Concert Vegas 2016” features a mixture of her signature Mandarin Chinese and Taiwanese songs. On Feb. 9, The Linq Hotel and & Casino opens the Chinese New Year celebration with a New Year’s ribbon cutting, live authentic dragon dances, an eye painting ceremony and performers dressed in elaborate costumes. Dragon dance performances by Lohan School of Shaolin will be held nightly at 7 p.m. and 2:30 p.m. on Feb. 14. At Wynn Las Vegas, three, 800-pound Tang Dynasty horse sculptures will be on display through Feb. 14. The nine-foot-tall, 10-foot-long horses were created by master sculptor Sillipachai “Mod” Toonrud of FORTE Specialty Contractors in Las Vegas, and are painted red and gilded in gold leaf. 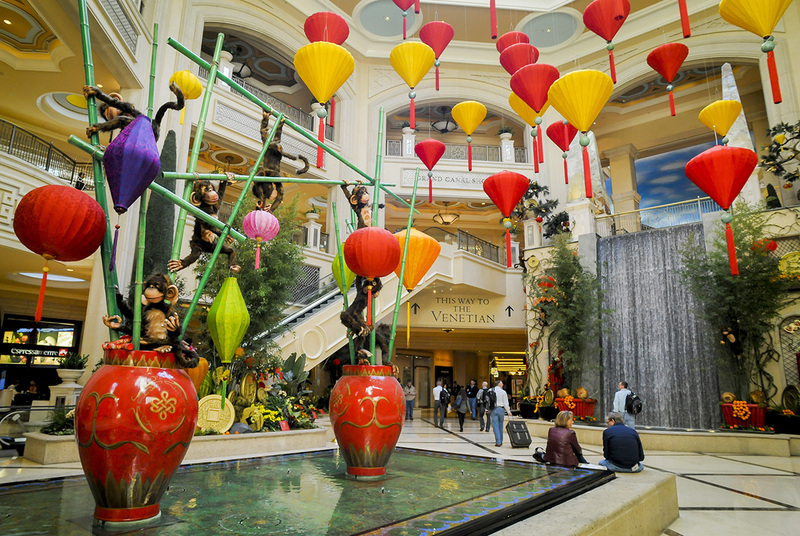 Also, the atrium at Wynn Las Vegas and the entrance of Encore at Wynn Las Vegas are decorated with sculptures dedicated to welcoming the Year of the Monkey. In addition, both hotels will give guests a Chinese New Year experience through the traditional lion and dragon dance ceremony. The dance starts at the South Valet entrance of Wynn Las Vegas and concludes its festive and entertaining show at the front desk of Encore at Wynn Las Vegas, ensuring guests of both hotels the chance to see the traditional dances. Mandarin Oriental, Las Vegas will ring in the Year of the Monkey on February 8, 2016 at 11 a.m. with a festive Yusheng Toss, inspired by the age-old tradition. Meant to bring good luck, health and happiness in the New Year, participants will come together to “toss” a dish made up of ingredients that represent a happy life in a delightful and delicious celebration of good fortune. The dish is traditionally comprised of raw fish for abundance, shredded carrots for blessings and good luck, green radish for eternal youth, white radish for prosperity in business and other ingredients to bring overall happiness and wealth to those that toss and consume the traditional dish. Special guest, Dr. Katie Zhong, Senior Director of Clinical Research and Development for the Cleveland Clinic Lou Ruvo Center for Brain Health, will preside as Guest of Honor at the event. The “dotting of the dragon’s eye” is considered as one of the most important events during the Chinese New Year. While hosted at many Las Vegas properties, The Cosmopolitan of Las Vegas will amplify the traditional event as 30 performers will awaken the dragon and lions by dotting their eyes with red paint. As soon as the eyes have been dotted, the dragon will officially come alive and begin twisting and turning as it leads the lions throughout the casino floor. Aside from the dotting ceremony, The Cosmopolitan of Las Vegas also welcomes the “Lucky Cat.” The “Lucky Cat” can be found on the casino floor in the form of a nine-foot tall interactive art exhibit. The cat is designed to bring good fortune for those curious enough to touch the Lucky Cat’s paw, which dispenses a fortune card once the paw is touched. As an added bonus, a few lucky guests will receive a golden ticket for a once in a lifetime experience at the The Cosmopolitan of Las Vegas. Also, on Feb. 13, The Cosmopolitan of Las Vegas will host Xuân Yêu Thương, an event with entertainment icons, including Dam Vinh Hung, Thu Phuong, Tran Thu Ha, Quang Linh, Duy Manh, Lam Vu, Phuong Trang, Quang Toan, Khanh Di, Phuong vu, Tan Hy Khanh, Viet Huong, Hoai Tam, DCP Dancers and MC Thanh Tung[CF1] . The Las Vegas Chinatown Plaza will host a day of Chinese New Year celebrations with authentic Asian food from Canton, Mandarin, Vietnamese, Japanese, Hong Kong and Hawaiian cuisines. In addition to the food, guests can watch cultural performances such as the Lion & Dragon dances, Chinese martial arts and many traditional Asian dance performances. The celebration begins at 10 a.m. on Feb. 21. For the first time, Chinese New Year in the Desert will be held in multiple locations over a one-week period. Participating venues include: The LINQ Promenade, The Boulevard Mall, Downtown Container Park, Fashion Show Mall, Las Vegas Natural History Museum and The Forum Shops at Caesars Palace. On Feb. 13, at 11 a.m., the 5th annual Chinese New Year in the Desert will excite onlookers with the Las Vegas Spring Festival Parade as it winds through Downtown Las Vegas. Filled with artistic floats, traditional holiday costumes and lively dancing, the parade will make its way down Fremont Street and end with a party at the Downtown Container Park. The Hunan Provincial Song and Dance Theatre Company will perform a traditional lion dance, model traditional and modern Chinese attire and showcase cultural performances featuring talented singers, musicians and acrobats at the Fashion Show Mall on Feb. 12. Local businesses, organizations, bands, drill teams, and dance groups will come together on Fremont Street to celebrate the Chinese Lunar New Year with extravagant floats in vibrant colors to commemorate the most important holiday of the Asian community. The Fourth Annual Las Vegas Spring Festival Parade will be open to the public on Feb. 13 at 11 a.m. Immediately following the parade, guests can take part in the After Party at Downtown Container Park, an open-air shopping center filled with boutique retail shops, unique restaurants, live entertainment and an interactive playground featuring The Treehouse. Also, to commemorate the Lunar Lantern Festival, which officially ends the Chinese New Year celebrations, students of Clark County School District will construct paper lanterns marked with their “wish” for 2016. Guests and onlookers are invited to stop and build their own complimentary lantern. Hakkasan at MGM Grand is serving delectable dishes related to the 2016 Chinese New Year ideals of joy, luck and prosperity. Guests may enjoy a double boiled fresh ginseng and chicken soup, wok-fried lobster in spicy truffle sauce, Pipa duck, grilled Chilean seabass or Hericium mushroom stir-fry. Guests can also enjoy a dessert and cocktail inspired by the Year of the Monkey. The Golden Halo dessert is a banana and peanut cake, while the 9 Hóu cocktail comprises nine components representing the monkey’s ninth position on the zodiac, including Bacardi Maestro de ron, sherry, banana liqueur and guava. ARIA Resort & Casino Mixologist Craig Schoettler, will feature the popular Chinese spirit, Baijiu, for the holiday. Baijiu, a distilled spirit from Sorghum with a rich, potent floral aroma, is a traditional beverage dating back a thousand years with rich roots in culture and celebration. Kweichow Moutai, the most popular spirit in China, is a brand of Baijiu that has been fermented for 40 days, distilled seven times and blended with 200 different base spirits from Moutai in the Guizhou province, giving it a unique and distinct flavor profile. Varieties of the spirit will be available by the shot and bottle as well as featured in specialty cocktails at Blossom and the Baccarat Lounge. Offers very traditional Beijing dishes like the Beijing Duck, steamed Sea Bass and MR CHOW noodles are classic dishes. Chef Simon To will offer a special limited-time menu to celebrate Chinese New Year. A variety of authentic dishes on the special menu include: Roasted Pork Belly; Firecracker Manila Clams, infused with Chinese white wine, fish paste, and spicy roasted pepper; and Winners Daily Soup. Guests can enjoy a special Cantonese Dim Sum menu, February 5-12, 11:30 a.m. – 2:30 p.m., featuring signature dishes such as Steamed BBQ Pork Bun and Bird’s Nest Egg Custard. The restaurant also will be open for dinner 5:30 p.m. – 10:30 p.m. offering its regular menu items.